Eric Pickles who is the Communities Secretary keeps on coming up with ideas that I'm quite liking. Of course how can I not like someone who causes Bracknell Council leader Councillor Paul Bettison to run to the defence of Bracknells Bi Weekly bin policy. He want local authorities to have more power (see his speech at the Local Government Association annual conference. He's pledges to cut 'bloated' council pay. Frankly I'm shocked at how quickly Eric Pickles is getting on with his job. I'm also shocked as he is one of the Tories I didn't like but now I have seen him in action he has changed my mind. Keep it up Mr Pickles. He wants local authorities to have more power, yet he sticks his oar in regarding such minutae of local government as unnecessary signage? Seems like he'll end up in a bit of a Pickle (ho ho) if he carries on like this, supposedly desiring to devolve power while opining magisterially from the centre. 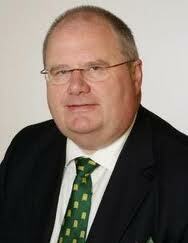 Eric Pickles wants to dictate to councils on everything they do then claims he wants them to have more power ? Contradiction or hypocrisy ?